Think the government won’t take your property because this is America? Think again. Recently, one of the United States Supreme Court Justices shined a light on a disturbing trend of government officials taking our money and property in Leonard v. Texas. Forfeiture (formally civil asset forfeiture) is the procedure whereby federal and state officials seek lawful and permanent possession of your assets, such as money and property that may be seized during an encounter with law enforcement officers. The Washington Post has published a six-part investigative series addressing abusive forfeiture practices. If you’d like to read this in-depth report on the problem, you can find it here. Co-counsel Howard Manchel and I recently represented a client who had a substantial amount of cash seized from his car. Our client, who did not trust banks in general as a matter of culture, had stored money he had borrowed to buy a business in a hidden compartment in his car. Although no criminal charges or traffic citations were issued, local law enforcement seized the money from the car. Through the client’s persistence and our legal assistance, his funds were ultimately returned in full. That outcome is unusual, however. Most money and property seized through forfeiture is retained by the agency that took it, in part because few victims of the practice have the necessary knowledge and resources to pursue the matter. If you have any property seized by law enforcement, you should consult with an attorney immediately regarding the potential return of your property regardless of whether there are any resulting criminal charges. By now everyone has seen the video of David Dao, a 69-year-old doctor, being dragged off his flight on United Airlines. Dao’s attorney has described his client’s unceremonious ejection as more traumatic than Dao’s escape from war-torn Vietnam in 1975. Can you hear the roar of a massive lawsuit gaining steam? From Dao’s viewpoint, the incident was reprehensible. Most in his position would be gearing up to sue everyone involved and going after United Airlines itself in a big way. He received substantial injuries while being yanked through the plane, and worse yet is the personal humiliation now that his awful experience has been shared all over the internet. What’s more, the incident has the potential of being racially-based. It’s not only Dao who’s probably thinking of suing, either. From the standpoint of the other passengers on Dao’s flight, this is a traumatic event and very much a wakeup call. There will no doubt be numerous trauma-driven claims, given reports that witnesses are now afraid to fly, worried that they could fall victim to the same kind of violent, unprovoked treatment. If anyone on that plane does fly again, you can be sure it won’t be with United. From management’s position, this was so avoidable! Without minimizing the experience of Dao or his fellow ticket-holders, it’s probably fair to say that United executives are traumatized as well. They can see what a disaster the event is for the company and surely most also recognize how unnecessary the PR calamity truly was. United has no excuse for creating and allowing this whole fiasco. There were so many ways around the problem. You don’t board the plan until the overbooking issue is resolved. If the booking issue is only discovered once customers have boarded, you then offer incentives until someone accepts an alternative flight. After all, everyone has a price, and it’s safe to say that price is millions of dollars less than the fallout from this event will be, even if nobody was ready to get off the plane at the first offer. Or, specific to this incident, you find another solution to get the flight crew to their destination, which was the need that led to Dao’s forced removal. The bottom line is money, so you figure out the least expensive alternative, whether that’s cancelling the other flight, offering incentives, finding another crew or some other reasonable solution to the problem. The one thing you don’t do is violently drag an elderly ticketholder off the plane, screaming, with horrified fellow passengers filming the event so the entire world can watch the debacle. Millions of viewers are aghast, wondering if it can happen to them, and guess what? It can! This disturbing incident should trigger the awareness that all that fine print accompanying the transactions we sign each day means something. Are you really giving Apple the right to force you into a human centipede scenario when you update iTunes? Probably not, but then David Dao didn’t expect to be injured and embarrassed when he signed for his ticket on United, either. I imagine this incident will do more than just make airlines rethink their practices, it will make consumers aware of the more overly-broad small type in agreements and contracts. When election years come around, the Halloween decorations sometimes take a decidedly personal turn. This year’s passionate feelings on all points of the political spectrum have inspired some particularly gruesome scenarios in front of houses and businesses, with Trump and Clinton appearing in situations that are unpleasant to say the least. Is there a legal limit to Halloween decorations that portray identifiable individuals? Based on the first amendment right of free speech, it’s perfectly okay to show Clinton, Trump or anyone else who inspires animosity being eaten by wolves or dispatched in another horrific manner that pleases the property owner. That comes as a surprise to many, who perceive this kind of expression as a direct threat. Making threats directly against a person is not protected speech, and a statement like “I’m gonna kill that guy” made on Facebook or elsewhere may be prosecuted under the law. But depicting a gory scene with Halloween decorations and threatening to actually carry out such an act are two different behaviors. 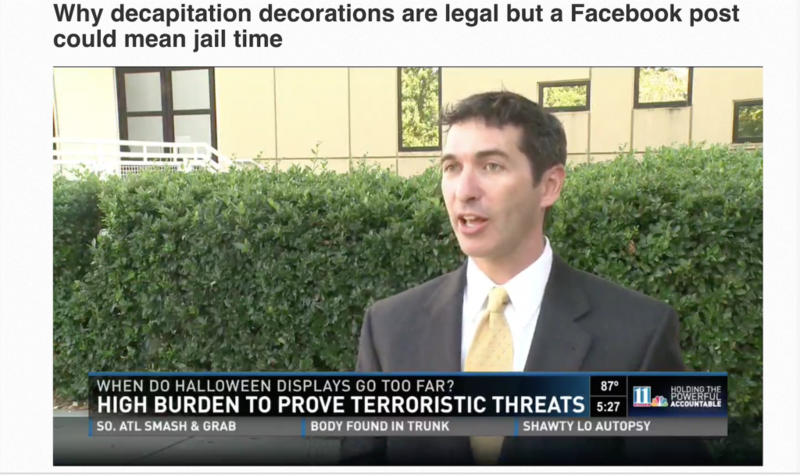 11 Alive, Atlanta’s local NBC affiliate, interviewed me as part of their report on the important distinction between freedom of expression, as with Halloween decorations, and making terroristic threats, which can be a felony. Like travelers across the country, Sandy Wallack has been keeping a keen eye on the progress of a class action lawsuit against Delta and Air Tran. Now a judge has ruled that the suit can proceed to trial, clearing the way for lawyers to argue their case in court and potentially get some money back for those who have used the airlines in recent years. The suit claims that the two airlines used anti-competitive practices when they created their secret agreement to make flyers pay a fee for all checked baggage. Prior to that move in December of 2008, travelers could check the first bag at no cost, paying only for subsequent bags or luggage that was above the airlines’ size or weight guidelines. The case is a complex one with multiple aspects that may affect the final resolution. 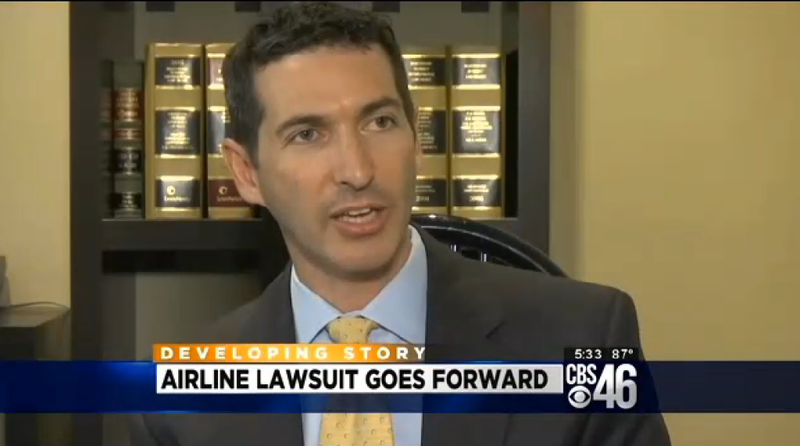 Sandy Wallack commented on the pending litigation for a Channel 46 CBS News segment, (video shown below and article here), advising hopeful travelers not to get too excited just yet. Whatever the outcome, it’s going to be a long trek from last week’s legal hurdle to the point of seeing any reimbursement checks go out, should the suit be successful. Still, it’s a possibility that’s nice to think about for the many who travel on Delta or used to travel on AirTran! Regardless of the outcome for individual travelers, hopefully the suit reminds airlines and businesses in general to treat its customers fairly. Being charged with a Violation of the Georgia Controlled Substances Act (V.G.C.S.A.) is bad news, as most people know. What many people don’t know is just how bad it really is. The consequences are more severe than they were in previous decades and those who run afoul of these laws often find themselves surprised by the punishments that accompany such a conviction. • Notification to school, superintendent, and teachers/administrators of the student’s conviction, which may trigger a suspension or expulsion. • Suspension from a public college or university for the current term. • Automatic loss of eligibility for HOPE scholarship and HOPE grant funds. • Loss of eligibility for federally funded student loans such as Direct Loans, Education for Public Service loans, and Graduate on Time loans. • Private school students convicted of controlled substance violations will become ineligible for any public grants, loans, or scholarships intended for education. Students convicted of drug offenses may also find that transitioning to work becomes extra challenging due to the many controlled substance violation penalties that affect a citizen’s right to work and own or drive a vehicle after such a conviction. In a subsequent post, we’ll examine these and other areas that are negatively impacted by such a conviction. If you or a loved one faces charges related to drugs, it is very important that you seek competent legal advice immediately. The potential consequences are far too large and serious to shrug off or leave to chance. 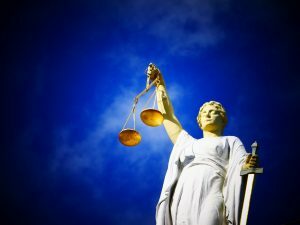 If you have been convicted of a crime in the State of Georgia, there are multiple post-conviction remedies available to help you attack the conviction and seek to have it overturned. The following is an oversimplified list of the procedures available. The first procedure available is a motion for new trial, which is filed in the same court in which you were convicted and, typically, ruled upon by the same judge who presided over your trial. 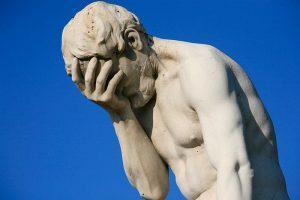 A motion for new trial allows the trial judge to correct any error on his/her own, rather than potentially having an appellate court rule that the trial judge erred (i.e. the trial judge can clean up his/her own mess). Pursuing a motion for new trial is discretionary and, thus, you may opt to forego this step and directly pursue an appeal. This is only recommended, however, in limited instances. (In most situations, you may as well use all your swings.) Further, in order to raise some grounds on appeal, such as ineffective assistance of trial counsel, you must pursue a motion for new trial in order to be able to present evidence or testimony at the motion for new trial hearing. You’ll need to present it there in order to make a record for appeal. If your motion for new trial is denied or you elected to forego a motion for new trial, you have the right to appeal your conviction. Your appeal will be heard by the Georgia Court of Appeals unless you were convicted of murder, in which case it will be heard by the Georgia Supreme Court. If your appeal is denied by the Court of Appeals, you may seek to have the Georgia Supreme Court review the decision through a petition for a writ of certiorari. Alternatively or if denied by the Georgia Supreme Court, you may seek to have the United States Supreme Court review your appeal through a petition for a writ of certiorari (though this is a complicated and expensive process). If unsuccessful on appeal, you may seek review of your criminal conviction through a writ of habeas corpus, which is essentially a civil lawsuit that challenges your incarceration on constitutional grounds. This remedy is available in both state and federal court but is subject to strict time limitations. If you have been convicted but feel that your conviction is erroneous and you wish to fight it, you should carefully consider your options and consult a knowledgeable attorney at once. Your time is very limited for some options, so you have only a small window in which to act. Feel free to contact our office to discuss the best choices in your case. The purpose of requiring a person who has been arrested to post a bond is to ensure that they will appear to answer their charges at future court dates. If you have been arrested in Georgia on a state felony or misdemeanor charge and have a bond set, there are essentially four ways to post bond for your release. Signature Bond (also known as an Own Recognizance Bond) – The court setting your bond may allow you to be released without requiring you to pay any money or put up any property for bond to ensure your future appearance in court. In determining whether to grant a signature bond, the court may consider factors including, but not limited to, whether or not you have any prior criminal history, the nature of your charges, and your place of residence and connection to the county in which you were arrested. Additionally, if a signature bond is granted, you may be required to report to a county-run pretrial release program, which will monitor you while on bond to ensure that you appear as required and/or are complying with all conditions of bond. Cash Bond – You may post the full amount of the bond in cash at the jail. Once the case has been completed, as long as you have appeared in court as directed, your money will be returned to you. To assist in getting your money returned, you may provide a certified copy of the final disposition to the jail office where you posted the bond. Property Bond – In lieu of cash, you may put up your property for your bond. To do so, you will need to contact the sheriff of the county in which the property lies for the required paperwork and approval. Generally, the sheriff will require that the equity in the property must be two to three times the amount of the bond. During the pendency of your case, your property will have a lien on it from the sheriff. Once your case has been completed, as long as you have appeared in court as directed, your property will be released free and clear. Bonding Company (also known as a bail bondsman) – If you were not given a signature bond and cannot afford to post a cash or property bond, and many people cannot, you may choose to use a bonding company to post your bond. A bonding company will charge you a fee of approximately 10% to 15% of your bond amount. The bonding company is then responsible for the remainder of your bond amount. The fee you pay to the bonding company will NOT be returned to you once your case is over. If you fail to appear in court as directed, your bonding company may seek reimbursement for the remainder of the bond amount from you. To explore the details of the various options, you may want to explore the relevant Georgia statutes related to bond, including O.C.G.A. § 17-6-1 – § 17-6-18; § 17-6-30 – § 17-6-31; § 17-6-50 – § 17-6-58; § 17-6-90 – § 17-6-92; § 17-6-110 – § 17-6-114; and § 15-16-27. For a video that explains more about using a bonding company, check out the video on this page. Let’s hope you never have the opportunity to use your new-found knowledge. Should it happen, though, it’s better to be familiar with the process than to face yet one more confusing challenge at what’s already guaranteed to be a stressful time. Time and again, I hear this familiar refrain from clients: “The officer did not read me my Miranda rights so they have to dismiss my case, right?” Unfortunately, a failure to advise an individual of his Miranda rights will not cause an automatic dismissal of charges. In Miranda v. Arizona, the United States Supreme Court held that the admission of an elicited incriminating statement by a suspect not informed of certain rights violates the Fifth and the Sixth Amendment right to counsel. What this means is that any statement made by an individual in response to police questioning once that person is in custody cannot be used against that individual unless that individual was advised of certain constitutional rights. We are all familiar with those rights required to be given – known as Miranda rights – from television and movies: “You have the right to remain silent. Anything you say can and will be used against you in a court of law. You have the right to an attorney. If you cannot afford an attorney, one will be provided for you. Do you understand the rights I have just read to you?” While Miranda remains a landmark ruling, its effect is larger in media than reality. In order for Miranda to apply, two factors must be satisfied. First, the individual must be in custody. Being in custody is not limited to being locked up in jail, but rather, is construed more broadly. Second, the individual’s statements must be in response to questioning by a police officer. Miranda warnings are not required, for example, where an individual blurts out information spontaneously. It would be a violation of rights if a law enforcement officer does not give Miranda warnings to someone in custody, questions that individual, and that individual makes statements to the officer. The exclusive remedy for such a Miranda violation is that the court may exclude the individual’s statements at his trial. It is important to remember that statements you make before being in custody as well as statements made that are not in response to police questioning are generally admissible in the absence of Miranda warnings. Recently, I represented two clients who each contacted me because they had received calls from a law enforcement agency requesting they come in for an interview. Both clients were wise enough to immediately contact and retain defense counsel. Ultimately, for one client, we met with an officer, for the other client we did not. Both clients achieved the same result: neither was arrested or charged. So what do you do if you get a phone call from a police officer requesting or directing you go to the police department to talk? You immediately contact and retain criminal defense counsel. Why hire criminal defense counsel, you may ask, particularly if you have not done anything wrong? An incredulous agent with the Georgia Bureau of Investigation once asked me that very question during a client’s interview. There are multiple reasons why it is important to hire defense counsel and foolish not to, but all of them boil down to protecting yourself and your rights. Having a lawyer is not an admission of guilt. Defense counsel can advise you of your rights and potential consequences, including collateral consequences you may not be aware of. An attorney also acts as a buffer by interacting with the officer directly so you do not have to and, thus, can protect you from a police officer who might otherwise attempt to intimidate you into or while meeting with him. Defense counsel can prepare you for the type of questions you might have to answer if you meet with the officer and assist you in determining whether to answer particular questions while meeting with the officer. Defense counsel can also help you decide whether and when to halt a meeting with the officer. Finally, defense counsel serves as a witness to what is said by the officer and by you during a meeting should there be a difference of opinion later. The deeper issue, once you have retained defense counsel, is whether you and your attorney agree to speak with the police officer. From a practical standpoint, there are generally both pros and cons to meeting with a police officer, even for someone who is innocent. My advice to a client about whether to agree to be interviewed by a police officer is made only after reviewing relevant facts and circumstances with the client and weighing the potential benefits and consequences of meeting with the officer. Often my advice rests on whether the client’s goal is to avoid being arrested or to avoid being convicted.